Traditional wines produced with modern methods: this is the philosophy of Villa Poggio Salvi. Wine is made in the vineyard but once it reaches the cellar it's very important to accompany it with knowledge, respecting the characteristics offered by each vintage. Villa Poggio Salvi, because of its structure and modernity, is a winery that looks to the future respecting the past base on the simple elegance of Sangiovese Grosso refined in large capacity oak casks as per historical tradition. 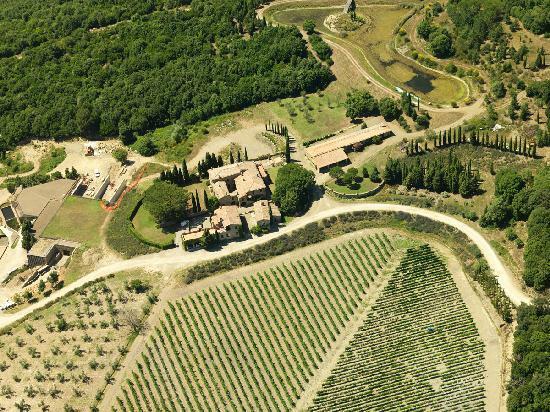 Villa Poggio Salvi owes its name to its fortunate location on the South side of Montalcino, overlooking the Tyrrhenian Sea. Clean air and the perfumes coming from the dense oak forests and the Mediterranean that surround the company, attracted here people coming from Maremma since ancient times. Poggio Salvi in fact stands for "Healthy Poggio", and has always been considered a salubrious and pure area, where people used to find shelter from diseases and viruses. Montalcino Historical Archives tell us that this place was famous for its wines, served to the most prestigious characters, already in the 16th Century. Wine Spectator 93"Pure, delineated and bursting with rose, cherry, strawberry, mineral and tobacco flavors. Comes across as linear, with tension, persistence and a refined structure. Best from 2020 through 2032. 2,500 cases made."